Dear friends, colleagues and competitors from all over the world! 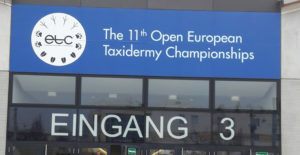 With a lot of joy, satisfaction and …also a bit proud, we are looking back to the best and biggest taxidermy show which has ever been held on European ground. We strongly hope that this event will stay in everybody’s heart as an unforgetable souvenir. To all of you who are disappointed…be it about the results or because you were not able to attend, the next show will definitively come. Please accept our apology for all the mistakes which have happend during the event. Please remember, from the ETC® – side only a small team of dedicated people have organized it on a voluntary base, living at their limits for many months, and I truly hope that this fact generates a little thankfulness in one or the other hearts. That show would not have been successful without ALL OF YOU! You made it big and you are the reason for the existence of the ETC®. Please never forget that! In this spirit we wish you all the best and hopefully see you the next time again. ETC® 2018, report, results and winner lists available!